My debut album, Main Squeeze!, is now available for digital download and streaming everywhere you listen to music. Also, physical purchases are available through my website in the "store" tab. Saskatchewan's Grammy nominated polka band, The Western Senators, backed me on this album. This project was derived from my performances on season 7 of PolkaRama! which is also available. In other news, Scott Heatcoat and I have a show coming up on May 12th in Hoadley, Alberta. The line-up looks excellent and we're excited to be sharing the stage with the other performers. We hope you can join us! This weekend Scott Heatcoat, and I were honoured to perform at the 13th Annual Festival of Stars in Radway, AB. This is the third time that the event has been held in Radway, prior to that it was held in Bashaw, AB for 10 years. I've had the priviledge of being a part of the event for the last 6 years. Every year it's so great to visit old friends and make new ones too. This year the event ran from May 19th through to the 21st. Scott and I had two performances with one at 11:00AM, and again at 4:00PM. Both shows were packed to capacity, even more than last year! Looking forward to returning next year!! Happy New Year everyone! I hope everyone had a great Christmas season! I brought in the new year with The Western Senators at North America's Greatest Dancehall, Danceland in Manitou Beach, SK. For the last 4 years I have ended the year and began a new year in the same building. It's great to celebrate with so many familiar faces and new ones! 2016 was a great year for me, with performances around Alberta, Saskatchewan, Montana, and North Dakota. 2017 promises to be a great year, and I'm looking forward to it! January 13th, I will be performing with The Western Senators at the Living Sky Casino in Swift Current, SK. If you're in the area I hope you can join us to celebrate Ukrainian New Years! Hope to see you all in the new year! Had a great oktoberfest season this year, busy - lots of travelling, but wouldn't have it any other way. To start the tour I was in Whitefish, MT with The Western Senators for the Great Northwest Oktoberfest, a fantastic time; and the tent was jam packed for the three days. From Whitefish we hit the road to Minot, for Norsk Hostfest. Four days of shows with Frankie Yankovic's grand nephew, Bob Kravos. An all around good guy and great musician, and I hope I get the chance to perform with him again in the future. The Jordan Rody Band was also busy north of the border with performances in Edmonton, St. Albert, Grande Prairie. I logged about 5000 kilometers, one of my most travelled oktoberfest seasons yet. "It's that time of year again, Oktoberfest is here again!" From there we hit the road home! But we got plenty of shows back home too! The Jordan Rody Duo will be at Crown & Tower Pub in St. Albert, AB October 10th. The following week, October 17th, The Jordan Rody Band will be performing in Clairmont, AB at the Canadian German Hall. October 29th, Jordan Rody will be wrapping up the oktoberfest tour for a stop in Grande Prairie, AB at Maddhatters with The Hammertones. See you out on the road!! Kick Off to Festival Season!!! This Festival sesson is off to a great start so far! It started out with a performance May 9th, in Rosthern, Saskatchewan. 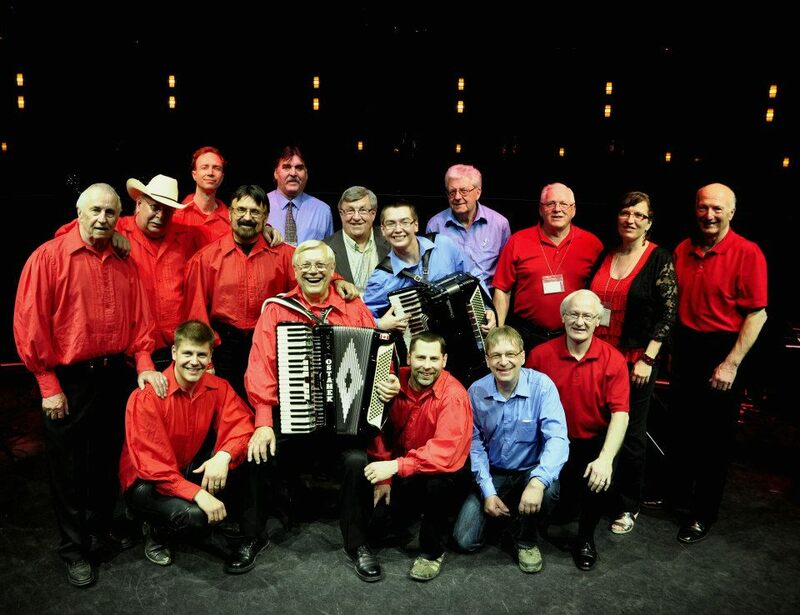 I was fortunate enough to join Saskatchewan's Grammy nominated polka band, The Western Senators for this show. We opened up for Juno winner, Donny Parenteau. Great to see so many familiar faces there. 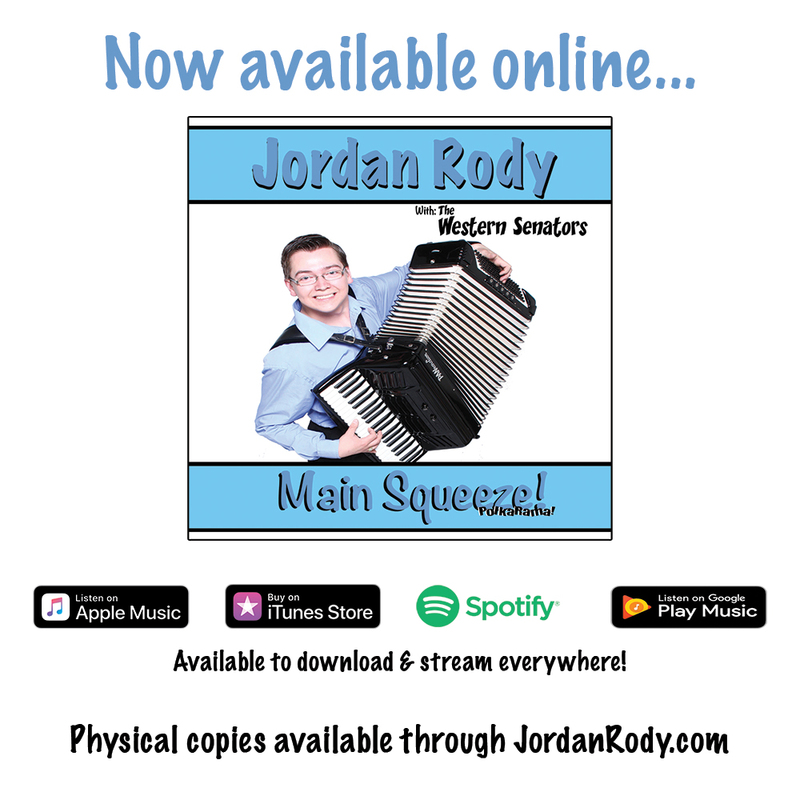 Today, May 17th, The Jordan Rody Duo had a performance in Radway, AB at Festival of Stars. The show used to be held in Bashaw, AB. Last year the festival went on hiatus but they are back and growing bigger! The show was very well received, and things are in the works already for next year so keep checking back for more info. Friday May 22nd, I'll be performing in Regina, SK at The Cathedral Village Arts Festival Polka Party with The Western Senators! Come by to see PolkaRama LIVE! The show runs from 9PM-12:30AM at the Cathedral Neighborhood Centre. Bring some friends, "this is polka music on steroids!" October 11, The Jordan Rody Duo had an awesome time at the Crown & Tower Pub in St. Albert, AB. The place was packed to capacity and people had to walk out as there was no place to sit. The food was great and the beer was flowing, the pub had a beer deal - a 32oz stein for $10 AND you got to keep the stein! Needless to say a lot of people walked away with steins. Special thanks to the Crown and Tower for having us there and to Rickard's (Molson Coors) for sponsoring the event. Next weekend, October 18th, I will be performing at Alder Flats Community Agriculture Society in Alder Flats, AB. Bratwurst supper, Live entertainment, featuring yours truly, and Edwin Erickson & Tight Squeeze, European Beer sampling tables. Doors open at 7PM and tickets are only $20! This is a fundraiser to help the community build a new arena, come out and help a great cause and have fun! October 25, I will be performing with The Hammertones in Grande Prairie, AB at Maddhatters Lounge for the annual Oktoberfest event. If you're in the area come by and say hi! I had an awesome time performing at the Queen City Ex in Regina, SK with The Western Senators. The exhibition ran from July 31-August 4, and we performed two shows a day, plus a pancake breakfast on Sunday. The pancake breakfast was very well received and everyone enjoyed themselves. I was also fortunate enough to talk with Courtney Minenko (Polka Queen) from NewsTalk CJME 980 in Regina. If you want to check out the online version of the interview (click here). My next run with The Western Senators will be August 16-17 at the Northern Lights Bluegrass & Old Tyme Music Festival near Big River, SK. For more information click here. An AMAZING trip to Regina, SK to perform for the 6th Annual PolkaFest April 26th and 27th at Casino Regina. April 26th Canada's Polka King, Walter Ostanek and I did an interview on CTV Morning Live - Regina then they had us play the show out. At the PolkaFest I shared the stage with Ken Runge and the Polka Pals, and Canada's Polka King, Walter Ostanek, and Saskatchewan's Grammy nominated polka band, The Western Senators. Willy Cole did a great job as emcee. The venue was just absolutely amazing and hospitality was great, they did a great job to make us feel welcome. A great time was had by all! April 29th and 30th I was VERY honoured to be a "Special Guest" for the 7th Season of PolkaRama! Starring Canada's Polka King, Walter Ostanek and The Western Senators. Thanks to Casino Regina, Brian Sklar, Walter Ostanek, Taron Cochrane, and EVERYONE for making this trip so memorable. Jordan to perform at Casino Regina! Jordan Rody is extremely honoured to have the opportunity to perform at Casino Regina for their 6th Aunnal PolkaFest in Regina, SK April 26th-27th, 2013.